Junk mail pours into our mail boxes daily, which can cause our home to have unneeded clutter. Having a system to getting rid of it, will help reduce one of the biggest clutter culprits in your home. This is a guide to disposing of junk mail. Whenever I receive an "invite" in the mail for a credit card that I do not want (an unsolicited invite), I tear it up into several pieces because I do not have a shredder and can't afford one right now. Then I take the pieces and put some in each waste basket around the house so just in case a thief wants to paste the information back together, all the pieces are not there. Some pieces are in the bathroom waste basket, some pieces are in the kitchen waste basket, some pieces are in the bedroom waste basket and not all waste baskets get emptied at the same time. This eliminates the risk of any personal information getting into the wrong hands. To cut down on junk mail, first, I "unsubscribe" from as many websites as I can. That cuts down on a lot of junk mail. Then, from the outfits I want to stop sending me mail, if they have included a postage paid envelope, I'll go ahead and fill out their survey (or whatever) but not include a check. See how much they value my opinion then! Sometimes I just return the postage-paid envelope, or I might include other junk mail. Fun! It almost makes it fun to get junk mail. 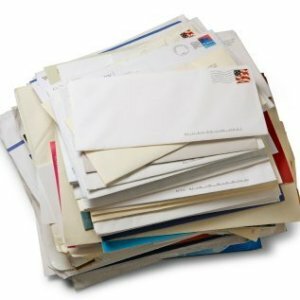 If you don't have a shredder, here is an easy way to "shred" your mail. Take all the mail you don't want, tear it up into little pieces, put it all in an empty envelope, seal it, and toss it in the trash. To keep the clutter down of junk mail coming in the house, we keep a shredder handy and go through the mail as soon as it comes in. Magazines, newspapers, ads, etc. go into a bag to be recycled. Anything with our name and address on it is opened and the "address" part of the mail is shredded to prevent anyone getting a hold of it. The rest of the mail is put in the recycle bag with the rest of the items. Dealing with the mail as it comes in daily has helped us a lot with having things setting around and cluttering up the desk. When the shredder is full, we recycle the shredded paper by putting it out in a bag marked with an X as instructed by our county waste disposal. Anything we want to look at goes on the desk to be looked at, at a later time. I can't tell you how much the shredder has helped to get rid of junk mail. When I bring in the mail, I head straight for the trash can and immediately sort out the junk mail. The rest goes in a small basket, until I get a chance to deal with it properly. I save up my junk mail until I get enough to mulch a section of my flower garden where weeds are a problem. You can lay the pieces of mail two, three or four pieces deep and spread over the area to be mulched. I recycle everything! My husband and I use the cloth bags that we use every week to get our groceries. I keep one next to my office desk, my living room chair, and the kitchen pantry, in order to toss things in after they are read. Take all junk mail directly to the recycle bin. Saves you time and mess. Also put any catalogs or magazines which you no longer want in the recycle bin as well. I mail it back to the sender if they enclose an envelope for which they will pay. Let them pay twice for the spam and they can get rid of the clutter. Otherwise if I can use the backs for note paper, I do that. I have a shredder. I shred all of my junk mail. I use the strips for packing materials when I mail boxes. (eBay) I also use them for paper mache projects with my children or kids in my class. I sort the colored paper out. Tip: Refuse Junk Mail And Return Unopened. I have, in the past, just written "refused" on the unopened junk mail and put it back in the mailbox. The postal service will take it away. The quickest way to get rid of junk mail is to have a wastebin (waste basket) somewhere near where you pick up the mail. Don't let the junk mail get any further. Drop it in the wastebin right there and then and you will have no worries about junk mail clutter. Go through what might be junk mail only one time; shredding or recycling the junk and saving what might be useful.